Medallion Made from Copper Recovered from the Wreck of the "Nuestra Señora de Atocha"
On September 4, 1622 the Tierra Firme flota of twenty-eight ships left Havana bound for Spain. With it was carried the wealth of an empire; Silver from Peru and Mexico, gold and emeralds from Colombia, pearls from Venezuela. Each ship carried its crew, soldiers, passengers, and all the necessary materials and provisions for a successful voyage. The following day, the fleet found itself being overtaken by a hurricane as it entered the Florida straits. By the morning of September 6th, eight of these vessels lay broken on the ocean floor, scattered from the Marquesas Keys to the Dry Tortugas. In them were the treasures of the Americas, and the untold stories of scores of Spanish sailors, soldiers, noblemen, and clergy. The heavily armed 'Nuestra Señora de Atocha' sailed as 'Almirante', or rear guard, of the flotilla, following the others to prevent an attack from behind the fleet. For additional protection, she bore the name of the holiest of shrines in Madrid. She had been built for the Crown in Havana in 1620 and was rated at 550 tons, with an overall length of 112 feet, a beam of 34 feet and a draft of 14 feet. She carried square-rigged fore and mainmasts, and a lateen-rigged mizzenmast. 'Atocha' would have had the high sterncastle, low waist and high forecastle of a typical early 17th century galeón. She had made only one previous voyage to Spain, during which her mainmast was burst, and had to be replaced. For the 1622 return voyage, 'Atocha' was loaded with a cargo that is, today, almost beyond belief -- 24 tons of silver bullion in 1038 ingots, 180,00 pesos of silver coins, 582 copper ingots, 125 gold bars and discs, 350 chests of indigo, 525 bales of tobacco, 20 bronze cannon and 1,200 pounds of worked silverware! To this can be added items being smuggled to avoid taxation, and unregistered jewelry and personal goods; all creating a treasure that could surely rival any other ever amassed. The 'Nuestra Señora de Atocha' sank with 265 people onboard. Only five -- three sailors and two slaves -- survived by holding on to the stump of the mizzenmast, which was the only part of the wrecked galleon that remained above water. Rescuers tried to enter the drowned hulk, but found the hatches tightly battened. The water depth, at 55 feet, was to great to allow them to work to open her. They marked the site of her loss and moved on to rescue people and treasure from Santa Margarita and 'Nuestra Señora del Rosario', other ships also lost in the storm. On October 5th a second hurricane came through, and further destroyed the wreck of the 'Atocha'. For the next 60 years, Spanish salvagers searched for the galleon, but they never found a trace. It seemed she was gone for good. Minted by Franklin Mint in bronze from ancient copper Ingots recovered from the shipwrecked Spanish galleon, 'Nuestra Senora de Atocha' by Treasure Salvors, Inc. The coin was sculptured by Don Everhart, a recognized metallic artist world wide. It comes with a unique serial number (in this case, it is AC3273) and a certificate of authenticity with the printed signature of Mel Fisher and a Certificate of Manufacture from the Franklin Mint, with the printed signature of Howard Blumenthal, the mint's director. Mel's portrait is in a soft mat-relief with the rest of the surface bright and shining. The inscription reads: "THE WORLD'S GREATEST TREASURE HUNTER Today's the Day!" with Mel Fisher's signature included. The reverse show a profile of the 'Atocha', the serial number, and dates of her 'lost age' (1622-1985). USS Constellation was a 38-gun frigate and the first ship to be commissioned in the United States Navy. She was distinguished as the first U.S. Navy vessel to put to sea and the first U.S. Navy vessel to engage, defeat, and capture an enemy vessel. She was 164 feet in length, displaced 1,278 tons, and carried up to 340 officers and soldiers. 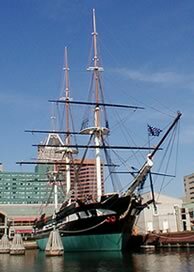 The original USS Constellation was constructed in 1797 by Joshua Humphreys at the Harris Creek Shipyard in Baltimore's Fells Point, and launched on September 7, 1797, just as the United States entered the Quasi-War with France. She was broken up for scrap in 1853 in Gosport Navy Yard in Norfolk, Virginia at the same time as the keel was laid for what would later be known as the second USS Constellation. On 9 February 1799, under the command of Captain Thomas Truxtun, Constellation fought and captured the frigate L'Insurgente of 36 guns, the fastest ship in the French Navy — the first major victory by an American-designed and -built warship. In February of 1800, Constellation fought a night encounter with the frigate La Vengeance of 54 guns. Constellation was victorious after a five-hour battle. Her speed inspired the French to nickname her the "Yankee Racehorse." Constellation also served in the Barbary Wars against Tripoli and in the War of 1812 against Great Britain. In 1840, Constellation completed a voyage around the world, which included becoming the first U.S. warship to enter the inland waters of China. The coin measures 1 1/4 inches in diameter and shows the likeness of the Constellation on the obverse. It reads, "U.S. Frigate Constellation - 1797". On the reverse, it displays an eagle clutching a shield and 2 naval cannons, and reads, "This coin struck from parts of the Frigate Constellation, the first ship of the U.S. Navy". However, it was thought that the first Constellation was simply rebuilt in 1853-4 to become the second one. Proof came during the renovation of the ship in Baltimore concluding in 1999 in which all evidence pointed to the construction of an entirely new sloop-of-war from the 1850s era and not the 1797 ship. Thus, although the coin states it comes from the 'first ship of the U.S. Navy", this is not the case. "HMS Victory" is the oldest commissioned warship in the world, and is still manned by Officers and Ratings of the Royal Navy. She is now the flagship of the Second Sea Lord and Commander in Chief Naval Home Command and lies in No 2 Dry Dock at Portsmouth Naval Base, Portsmouth. England. She is the only surviving warship that fought in the American War of Independence, the French Revolutionary War and the Napoleonic wars. In the latter she served as Lord Nelson's flagship at the decisive Battle of Trafalgar in 1805. Her excellent sailing qualities made her a very popular choice for use by Admirals as their flagship. Admirals Keppel, Kemperfelt, Howe and Jervis all used her prior to Admiral Lord Nelson when he was Commander in Chief of the Mediterranean Fleet. Even after the Battle of Trafalgar she continued her active career and was involved in two Baltic campaigns under Admiral Saumarez. Her active career completed on 7 November 1812 when she was then moored in Portsmouth Harbor off Gosport for 110 years fulfilling a number of roles. In 1831 the ship was listed for disposal but the First Sea Lord, at his wife's request, declined to sign the warrant. In 1889 Victory became the flagship for the Commander-in-Chief and remains so today. In 1903 she was accidentally rammed by HMS NEPTUNE under tow to the breakers. This event, together with the centenary celebrations for Trafalgar, raised questions about her future but nothing was resolved before World War. By 1921 the ship was in a poor state of repair, it was at this point that the Government supported by the Society for Nautical Research agreed that HMS VICTORY should be saved and to be a lasting reminder to the Nation of Admiral Lord Nelson, The Battle of Trafalgar, and the Royal Navy's supremacy in the days of sail. She remains now as the embodiment of the spirit and fine traditions of the Royal Navy. A small copper charm, issued by the British & Foreign Sailor's Society (B.F.S.S.) to commemorate the 100th anniversary of Lord Nelson's death at the Battle of Trafalgar, it dates to 1905. These medals were made from copper from Nelson's ships and were sold (for a donation of 1 shilling or more) in aid of the 'Nelson Centenary Memorial Fund' which was established to aid in the preservation of the ship for the future. The front bears the image of Nelson's flagship at the battle of Trafalgar, "H.M.S. Victory" and below the caption, "Victory - 1905". The reverse bears the inscription, "From B.F.S.S. - Nelson Centenary - Containing Victory Copper - E.R.VII" (King Edward VII). Keychain Made From the Foremast of the Clipper "Cutty Sark"
On the afternoon of Monday, 22nd November 1869, a beautiful little clipper ship of 963 tons gross was launched at Dumbarton on the Scottish Clyde. "Cutty Sark" was built for John 'Jock' Willis, a s His previous vessels had not had the performance results he wanted and his ambition for "Cutty Sark" was for her to be the fastest ship in the annual race to bring home the first of the new season's tea from China. The ship was designed by Hercules Linton, a partner in the Dumbarton firm of Scott & Linton. His achievement was to mould the bowlines of Willis's earlier vessel, The Tweed into the midship attributes of Firth of Forth fishing boats, creating a beautiful new hull shape that was stronger, could take more sail, and be driven harder than any other. Although her early years under her first master, Captain George Moodie, saw some sterling performances, fate was to thwart her owner's hopes of glory in the tea trade: in the very same year of her launching, the Suez Canal was opened, allowing steamers to reach the Far East via the Mediterranean, a shorter and quicker route not accessible to sailing ships, whose freights eventually fell so much that the tea trade was no longer profitable. So "Cutty Sark"'s involvement in the China run was short lived, her last cargo of tea being carried in 1877. For the next several years, she was forced to seek cargos where she could get them, and it was not until 1885 that she began the second (and more illustrious) stage of her career. The ship's heyday was in the Australian wool trade, which was overseen by Captain Richard Woodget from 1885 to 1895. Here was a virtuoso mariner who 'played' the "Cutty Sark" like the responsive 'instrument' she was: He knew how to get the last quarter-knot from the ship, and, during his time, she repeatedly made the fastest passage home from Australia. And yet by 1895, she was again no longer making money for her owner and was unceremoniously sold off to the Portuguese and renamed as Ferreira ~ although her crews referred to her (significantly) as Camisola Pequenina ('little shirt'). She labored steadfastly for her new masters for almost three more decades ~ regularly trading between Oporto, Rio, New Orleans and Lisbon, in the service of Portugal's colonial possessions. Dismasted in a storm in the Indian Ocean in 1916, she was re-rigged as a barquentine to carry less sail ~ a decision necessitated by a wartime shortage of spar timber. In 1920 she was sold again to another Portuguese company being renamed "Maria do Amparo" in 1922. She was now very much dilapidated, so Captain Dowman made his move ~ he approached her Portuguese owners, bought her for the sum of £3,750 and had her restored, re-rigged and flying the 'Red Duster' once again. Upon Capt. Dowman's death in 1938, his widow presented the newly restored clipper to the Incorporated Thames Nautical Training College at Greenhithe on the Thames, where the vessel remained until after the Second World War, when the college acquired a larger, steel-built ship for its cadets. Once more, "Cutty Sark" became 'surplus to requirements'. USS Maine (ACR-1)''', the first ship of the United States Navy to be named for the state of Maine, was a 6682-ton second-class pre-dreadnought battleship originally designated as Armored Cruiser #1. She was powered by twin screw vertical inverted triple expansion engines, manufactured by Quintard Iron Works, and generated 9,000 horsepower. Congress authorized her construction on August 3, 1886, and her keel was laid down on October 17, 1888, at the New York Navy Yard. She was launched on November 18, 1889, sponsored by Miss Alice Tracey Wilmerding (granddaughter of Secretary Benjamin F. Tracy), and commissioned on September 17, 1895, under the command of Captain A.S. Crowninshield. Her active career was spent operating along the U.S. east coast and in the Caribbean area. In January 1898, Maine was sent to Havana, Cuba, to protect U.S. interests during a time of local insurrection and civil disturbances. Three weeks later, at 9:40 on the evening of February 15, a terrible explosion on board Maine shattered the stillness in Havana Harbor. Later investigations revealed that more than five tons of powder charges for the vessel's six and ten-inch guns ignited, virtually obliterating the forward third of the ship. The remaining wreckage rapidly settled to the bottom of the harbor. Most of Maine's crew were sleeping or resting in the enlisted quarters in the forward part of the ship when the explosion occurred. Two hundred and sixty-six men lost their lives as a result of the disaster: 260 died in the explosion or shortly thereafter, and six more died later from injuries. Captain Sigsbee and most of the officers survived because their quarters were in the aft portion of the ship. On March 28, the US Naval Court of Inquiry declared that a naval mine caused the explosion. The tragedy was a precipitating cause of the Spanish-American War that began in April 1898 and which used the rallying cry, "Remember the Maine." At the time, it was used as pretext for war by those who were already inclined to go to war with Spain. On August 5,1910, Congress authorized the raising of Maine to remove it as a navigation hazard in Havana Harbor. On February 2, 1912, she was refloated under supervision of the Army Corps of Engineers and towed out to sea where she was sunk in deep water in the Gulf of Mexico on March 16, 1912, with appropriate military honors and ceremonies. 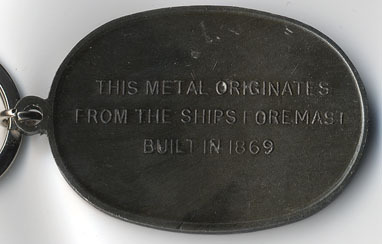 Materials from the USS Maine were recovered during this period, and numerous souvenirs were made from the recovered metal. The obverse of the medallion reads, "U.S.S. Maine - Destroyed In - Havana Harbor, Cuba - February 15th, 1998", and the reverse reads, "This charm - Made from Bronze - Recovered from the - Maine - And issued by the - Veterans of Foreign - Wars in Memory of - Our Departed - Comrades" The token, or charm as it is called, was made from bronze recovered from the ship for distribution by the Veterans of Foreign Wars. The token is 1 ½ inches in diameter, and suspended from a loop. USS Ohio, a 12,500-ton Maine class battleship, was built at at San Francisco, California. She was commissioned in October 1904 and served along the West Coast until April 1905, when she steamed across the Pacific to become flagship of the Asiatic Fleet. She returned to the United States in 1907 and, late in that year, began an epic cruise around the World with other battleships of the "Great White Fleet". 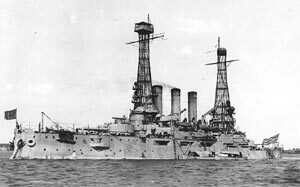 After the this voyage ended in February 1909, Ohio was modernized, trading her white and buff color scheme for a drab, but more practical, grey and receiving the first of what ultimately would be two "basket masts". She thereafter was primarily stationed in the Atlantic, where she served with combat forces and on training duty. In 1914 she sailed to the Gulf of Mexico to join in the patrol off Vera Cruz, protecting American interests endangered by Mexican political turmoil. Ohio returned north in the summer for a Naval Academy midshipmen cruise, then joined the Reserve Fleet at Philadelphia, recommissioning for each of the next two summers' midshipmen cruises, 1915 and 1916. This plug was taken from her protective deck. About an inch in thickness, it has a mushroom-like shape and is heavy for its size.